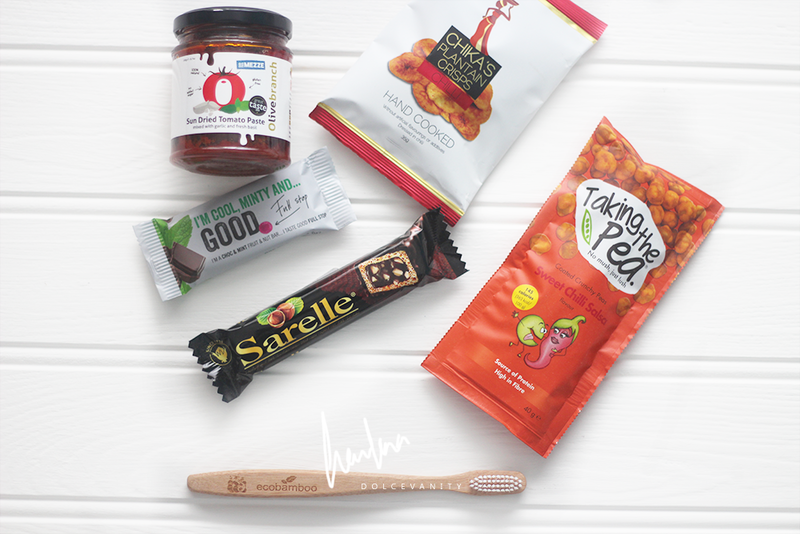 This months The Vegan Kind box is full of new brands and a Panda friendly toothbrush. I first tried the Sarelle Hazelnut & Dark Chocolate Cream Filled Wafer I love nuts in chocolate so I was excited to try this and I wasn't disappointed it was soft but slighty crunchy with the dark chocolate it added richness to this little snack. Good Full Stop Fruit & Nut Based Mint Chocolate Bar a blend of crushed dates, raisins and cashew nuts with natural date syrup, dark Belgian chocolate with an infusion of natural essences and fruit pieces. I'm not a fan of dates so I'm passing this one onto my nan to munch on but for those who do like the sound of this bar, it'll be good for an in between meals snack. The Chika's Chilli Plantain Crisps were demolished by me, nice and crunchy, can taste the plantains while the chilli blend is just right making these sooooo moreish. Taking The Pea Sweet Chilli Salsa crunchy marrowfat peas flavoured with sweet chilli salsa, no mushy peas like some of us dreaded on our plates but a nice snack to pass around and share. Olive Branch Mezze Sundried Tomato Paste always handy to spread onto dough and more as a nice tomato base, make your own pizza, in the box this month there's a recipe to use the paste as an idea as a pizza fiend, this will be nice to eat on a piece of bruschetta. Lastly it's the Ecobamboo Toothbrush I needed another toothbrush soon so this comes just in time, it's made by moso bamboo which isn't eaten by Pandas so their snacks haven't been taken away to make this. The environmental issue surrounding toothbrushes have been taking into consideration with the fact of how long it takes a plastic toothbrush to break down, it can take hundreds of years. The packaging and brush itself is 100% biodegradable made of plant fibre. So cute and environment friendly.